A ULA Delta 4 Heavy Rocket launches the NROL-15 spy satellite June 29 from Cape Canaveral, Fla.
A new spy satellite launched into orbit on a secret mission for the U.S. military Friday (June 29), roaring spaceward atop the world's most powerful rocket in use today. The NROL-15 reconnaissance satellite blasted off from a launch pad at Cape Canaveral Air Force Station in Florida at 9:15 a.m. EDT (1315 GMT) to begin its classified mission for the National Reconnaissance Office. 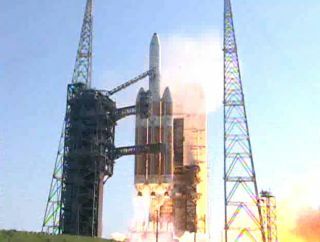 It rode a towering Delta 4-Heavy booster equipped with new RS-68A first stage engines — the most powerful liquid hydrogen rocket engines ever built, according to their manufactures. Built by Pratt and Whitney Rocketdyne, the new RS-68A engines are each capable of generating 702,000 pounds of thrust and are more efficient than a previous design, the rocket engine builders said, adding that the engine generates 36,000 more pounds of thrust than its predecessor.Three of the new rocket engines made their space launch debut in Friday's Delta 4-Heavy flight by rocket provider United Launch Alliance. The Delta 4-Heavy rocket is currently the largest and most powerful rocket in service. The booster features three core rocket boosters and is topped with a second stage to place payloads into orbit. It is 235 feet tall (72 meters) and can carry payloads of up to 24 tons into low-Earth orbit and 11 tons to geosynchronous orbits. Friday's launch came after several delays for the Delta 4-Heavy. The rocket was initially slated to blast off on Thursday, but ULA and Air Force officials pushed the launch back 24 hours due to weather delays from Tropical Storm Debby. During today's liftoff, a fuel valve problem prompted launch controllers to repeatedly hold the countdown. But the glitch was ultimately resolved, clearing the booster for flight. The successful launch marked the second space mission in nine days by ULA to orbit a classified payload for the U.S. military. The company, a joint launch services endeavor by Boeing and Lockheed Martin, launched the NROL-38 spy satellite into orbit just last week on June 20. "Phew! 2 launches in 9 days. Who says things slow down in summer!" ULA officials wrote in a Twitter post just after liftoff. ULA officials broadcast the secret NROL-15 satellite's launch live, but cut the feed off four minutes after liftoff at the request of NRO officials, a typical action for U.S. reconnaissance satellite launches. The next ULA launch will be an Atlas 5 rocket slated to loft another NRO spy satellite into orbit in August. That mission is expected to launch from the Vandenberg Air Force Station in California.